Barrus pioneered the innovative Post Immersion Restart System (PIRS) in the late 1970s for the RNLI and the armed services which enabled an engine to be rapidly restarted after being submerged. Further development resulted in an improved version, FAST PIRS in 2004. Barrus has now introduced the next-generation PIRS which will be shown for the first time at Seawork. The Special Products team at Barrus has developed two new versions of PIRS, GEN 2 FAST PIRS, a simplified, more durable and cost-effective FAST PIRS system and Capsize PIRS, a four-stroke adaptation. Similar to previous FAST PIRS versions, GEN 2 FAST PIRS drains the fuel system, but instead of using a single lever to control the system, all valves are operated independently to allow fine adjustment. This latest evolution has proved to be more reliable as the cylinder head valve design is more durable and cost-effective to produce and is fail-safe in operation. With the combination of environmental concern, the durability of two-stroke engines and customer demand, Barrus launched the four-stroke PIRS project in 2015, and have now developed a patented system for Mercury and Mariner four-stroke engines. Capsize PIRS is fully automatic and integrated within the engine’s electronic control unit. The system ensures no water can enter the internals of the engine and is operated without removing the engine cover, as, unlike a two-stroke engine, this can contaminate the oil and can cause serious component failure. The GEN 2 FAST PIRS system is already being used by commercial and military customers, and orders are in the pipeline for the Capsize PIRS engines to be supplied later this year. The latest Mercury Diesel 6.7L, I-6 commercial diesel will also be showcased for the first time at Seawork. This mechanically, fuel injected diesel engine sets a new benchmark for durability and reliability. It delivers excellent performance in a robust and functional layout. Several commercial duty cycle ratings are available including a medium duty rated model. Built on a proven platform and boasting several power options from 180hp (132kW) to 280hp (206 kW), these latest diesel engines focus on simple design features. All components have been designed and engineered to withstand the toughest conditions on the water. The engine block is manufactured from a high strength casting, and the crankshaft is forged from a high strength steel alloy. Both feature large bearing surfaces. 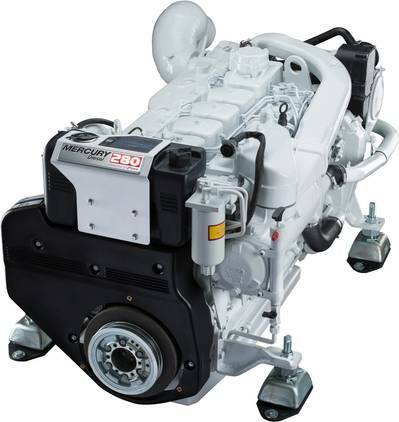 “Mercury’s new mid-range diesel engines provide us with opportunities in the light-duty commercial sector with applications for fast catamarans and pursuit craft, fishing vessels and workboats in addition to single and twin installations in pleasure boats, “ commented Robert Plant, General Manager for the Marine Diesel Division.